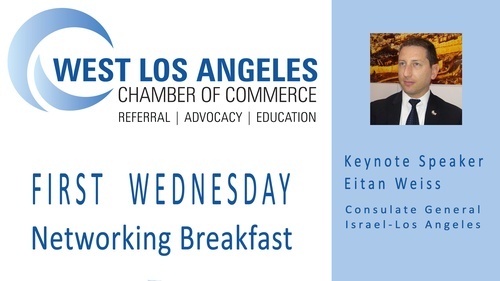 This month West Los Angeles Chamber of Commerce has the pleasure to host Mr. Eitan Weiss, Consulate Generale of Israel-Los Angeles. Mr. Weiss is an experienced diplomat with proven capabilities to advance national and local agendas and interests.Skilled in public affairs, national security, public apearance speech writing, foreign affairs, politics,commercial cooperation and policy analysis. Capable performer with high education and experience. The West Los Angeles Chamber is dedicated to providing opportunities for business owners to interact with each other as well as leaders in the community. We believe that it is important to develop relationships with like-minded business owners with the intention of helping each other succeed. This is one of the best ways to grow your business, even in this day and age of online technology. Nothing can replace an in-person interaction, the shaking of someone’s hand, etc.